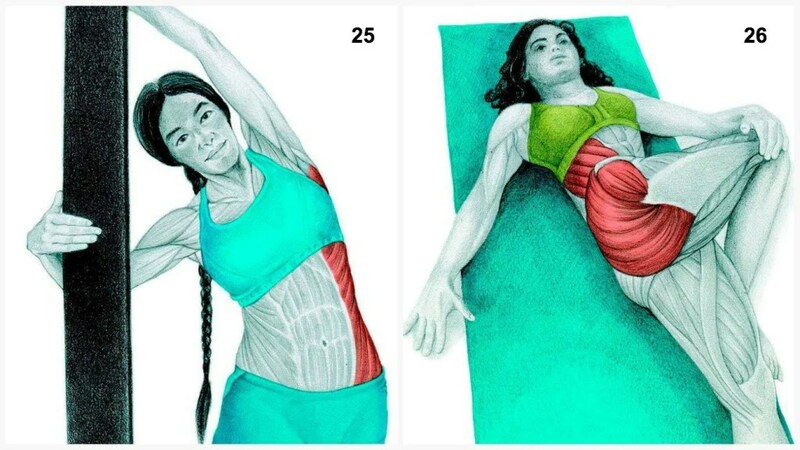 Vicky Timón, a yoga expert and author of “Encyclopedia of Pilates Exercises,” created these beautiful illustrations, and James Kilgallon, CSCS, creator of Mazlo’s Body Maintenance Program, contributed the expert commentary. Muscles highlighted: Rectus Abdominus and External Obliques. This stretch is best reserved for people who have good flexibility already. Sit on your heels and place your hands behind you as you push your hips up and forward. Avoiding putting too much pressure on your lumbar spine. If you have neck problems do not drop your head back. Muscles highlighted: Adductors. This is a great exercise to open the hips, and stretch the adductors and hamstrings. Start this stretch with your knees bent, and spine straight. As your muscles begin to release you can slowly straighten your legs, round out your back and reach for your feet. Lightly pull on the bottom of the balls of your feet to release the calf muscles as well. If you can not reach your feet you can use a belt or towel. You can also perform this stretch lying on your back with your feet going up the wall. Muscles Highlighted: Adductors. This is a deep groin stretch that can place pressure on your knees so it’s helpful to be on a soft surface. Start by resting on your hands and knees and slowly bring your knees wider until you feel a good stretch in your groin muscles. You will feel slight variations in the stretch as you actively push your hips back and forward. Muscles Highlighted: Adductors. Start with both feet forward in a wide stance with your legs as straight as possible. Slowly walk your hands to your right foot while bending your right knee and rotating your left toes up to the ceiling, sitting into your right hip. Keep your right foot flat on the ground. Muscles Highlighted: Adductors. Start in a seated position and bring the soles of your feet together and sit tall through your sit bones. Progress this stretch by placing pressure on your knees with your hands. The closer your feet are to your body the more you will stretch your groin muscles. Bring your feet farther from your hips and slowly round your upper body to release your back muscles. Muscles Highlighted: Forearm Extensor. Start by packing your shoulder down and back, then externally rotate the shoulder for the optimal position to stretch the forearm muscle. Once in this position apply pressure to your opposing hand to begin the stretch. You can progress this stretch by touching the tips of your fingers together in a tea cup shape. 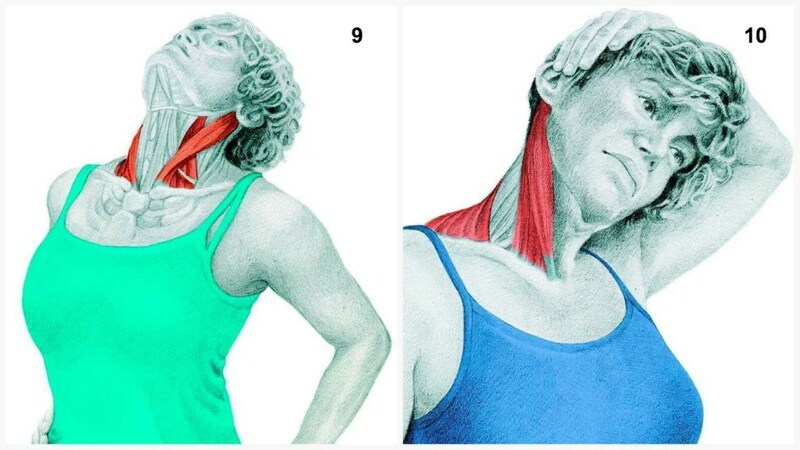 Muscles Highlighted: Sternocleidomastoid “SCM”. Try to keep your neck as long as possible while slowly dropping your ear to your shoulder, making sure you are not collapsing your cervical spine. 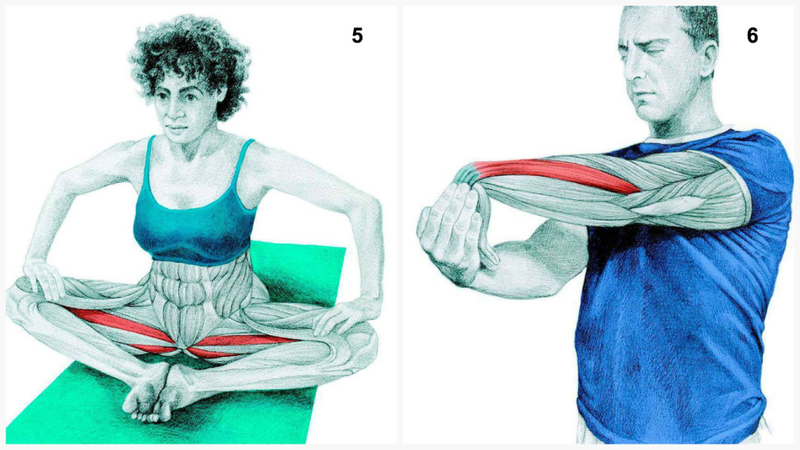 You can progress this stretch by being seated on a chair and grabbing the bottom of the seat. This will help you create consistent tension down the arm and neck which will allow you to target the upper traps. Muscles Highlighted: Sternocleidomastoid “SCM”. Start by slowly rotating your neck, while keeping your chin slightly elevated to isolate the SCM. If you would like to get a deeper stretch apply pressure with the opposite hand from the direction that you are rotating. 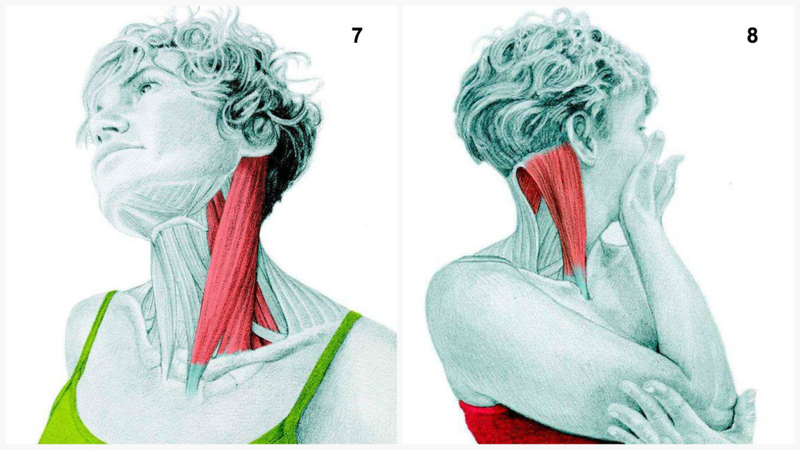 Muscles Highlighted: Sternocleidomastoid “SCM”. Start by placing your hands on your hips, while keeping your spine long start to tilt your head back, making sure you are not collapsing your cervical spine. Muscles Highlighted: Sternocleidomastoid “SCM” and Upper Trapezius. Try to keep your neck as long as possible while slowly dropping your ear to your shoulder, making sure you are not collapsing your cervical spine. You can progress this stretch by being seated on a chair while grabbing the bottom of the seat. This will help you create consistent tension down the arm and neck which will allow you to target the upper traps. Muscles Highlighted: Psoas and Quadracep. Start in a half-kneeling position. As you slowly bring your right hip forward you should begin to feel a stretch in the front of your hip. Grab your back foot and squeeze your back glute to increase the stretch on your Hip Flexors. Muscles Highlighted: Side Deltoid. Bring your arm across your body and lightly apply pressure to your arm to increase the stretch on your shoulder. Muscles Highlighted:Trapezius Muscle. Start by standing with you feet together. Keeping your spine long, slowly sit your hips back and round your upper back, tucking your chin to your chest at the same time. Muscles Highlighted: Latissimus Dorsi. Start by taking a firm grip on bar, then slowly lift your feet off the ground. 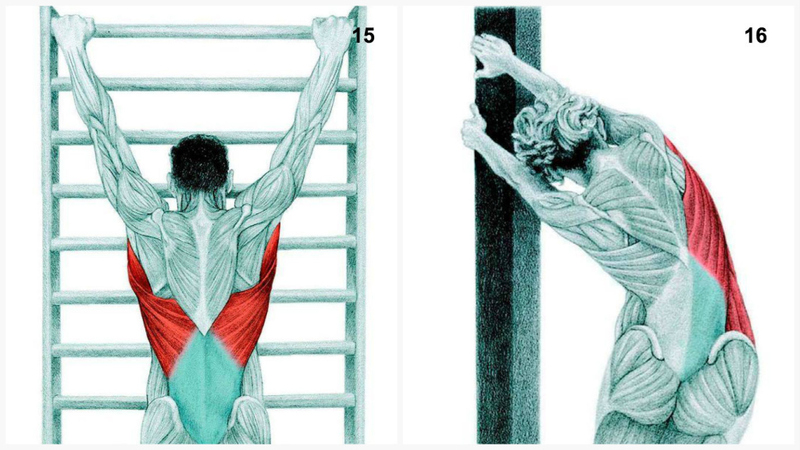 You should feel a stretch in your lats and chest. If you take your feet completely off the ground you will feel traction in your your lumbar spine. 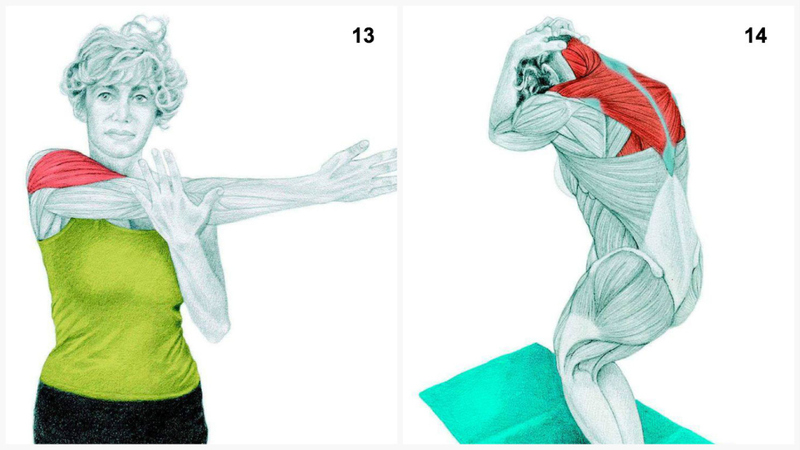 Avoid this stretch if you have recently injured your shoulder, and/or have impingement of the shoulder. Muscles Highlighted: Latissimus Dorsi. Start by placing both hands on the corner of a wall or post. While keeping your spine long, slowly push your hips out to the side. Avoid this stretch if you have lower back problems. Muscles Highlighted: Latissimus Dorsi. Start on your hands and knees then slowly bring your hips back until your forehead is on the floor. You can bring your knees wider to get a better stretch in your hips. Arch your upper back and externally rotate your shoulders to stretch your lats and chest muscles. Muscles Highlighted: Soleus and Gastrocnemius. You can perform this stretch on a rack or on the edge of a stair step. Lightly rotate your ankles internally and externally to actively stretch the calf muscles. 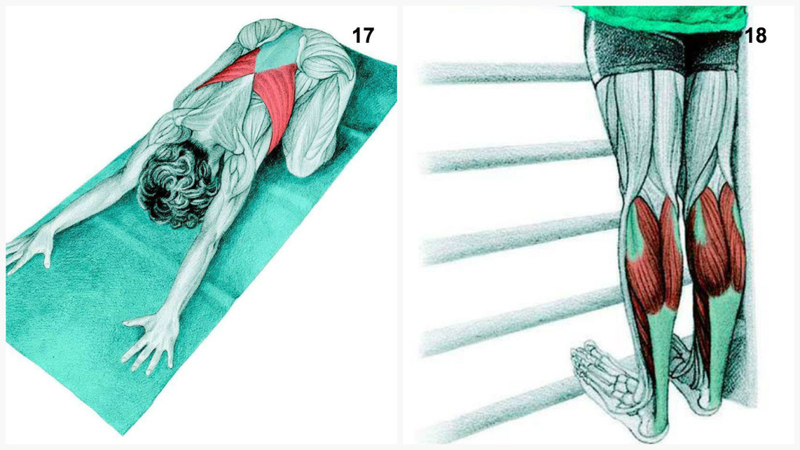 Muscles Highlighted: Psoas and Hamstring. This is an advanced stretch, proceed with caution if you have any hip problems. Start in a kneeling lunge position, it can also be helpful to have the support of a chair as your hip flexors and hamstrings release. Muscles Highlighted: Hamstrings and Calfs. Start by sitting into your sit bones and bend the knees if needed. As your flexibility improves your legs will naturally straighten. If you have back problems keep the spine as straight as possible. You can also perform this stretch lying on your back with your feet up a wall. Muscles Highlighted: Hamstrings. Start this position with one foot in front of the other. Bring your hands to your hips and while keeping the back straight, begin to bend from the hips. Muscles Highlighted: Glutes. This movement has a global effect on all areas of your body. If you have bad knees, or cannot keep your heels on the ground, practice your squat before proceeding. Start by standing with your feet shoulder width apart then slowly lower yourself into the deep squat. Once in position bring your arms inside your legs and lightly apply pressure to the inside of your knees, sitting into the hips and heels. You can also practice this position lying on your back with your feet against a wall. Muscles Highlighted: Glutes. Start in a seated position slowly pull your leg to your chest and externally rotate your hip while keeping your spine straight. You should feel this stretch in your glute. Muscles Highlighted: Soleus and Gastrocnemius. Start out in a lunge position with your back foot slightly turned out. Slowly bring your back heel to the ground to stretch your calf muscles. Muscles Highlighted: External Obliques. While keeping your spine long slowly push your hips out the the side. Avoid this stretch if you have lower back problems. Muscles Highlighted: Glutes and External Obliques. This is a great stretch for those trying to manage Sciatic Pain. Start by lying flat on your back then bring one leg across your body, slowly rotating your gaze and upper body in the opposite direction. The key to this stretch is using your breath to open up your rib cage and sacroiliac joint and hip area without placing too much pressure on the lower back. If you find this stretch to be too difficult you can stack both of your knees on top of each other. Once in this position you will feel more of a stretch on the upper spine when the knees are higher, and more of a stretch on the lumbar spine when the knees are lower. Muscles Highlighted: External Obliques and Latissimus Dorsi. With your spine long, slowly push your hips out to the side while keeping your shoulders externally rotated. 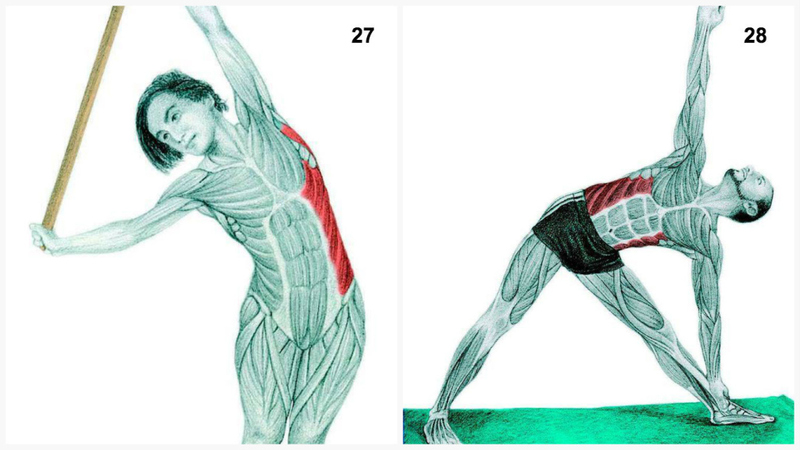 Avoid this stretch if you have lower back problems. Muscles Highlighted: External Obliques. Start with a wide stance with your front foot straight ahead, and your back foot at 90 degrees. Place your hand on your front leg or floor as you sit back into your front hip with a straight back. As you rotate away from your front leg keep your gaze on the hand that is in the air. Muscles Highlighted: Pectorals. Start by facing the wall with your thumb up. Slowly rotate away from the wall to stretch your chest muscle. You should feel this stretch in the belly of the muscle. If you feel it in the shoulder joint you are stretching too far. Muscles Highlighted: Chest and Latissimus Dorsi. Start by lying on the floor with your palms facing up. As you partner sits into a deep squat you should feel a stretch in your chest and lats. You will also get some traction in your spine from the stretch. Avoid this stretch if you have impingement of the shoulder. Muscles Highlighted: Anterior Tibialis. Start by sitting with your feet in front of you. Bring one hand behind you as you externally rotate your hip and bring one foot above your knee. To increase the stretch on your hip slowly lean forward, initiating the movement by hinging at the hips. Muscles Highlighted: Subscapularis. Start by lying flat on your back, bring your arm straight out to the side with your elbow at a 90 degree angle. Slowly bring the back of your hand to the floor. If you hand is far away from floor it means your rotator cuff and other muscles that control internal rotation are tight. Muscles Highlighted: Pectorals and Latissimus Dorsi. Position yourself far enough from a wall or rack so that when you touch the wall your body becomes parallel to the ground. Move into this position by hinging at the hips and keeping your spine straight. Once in position, push your chest forward creating a slight arch in your upper back, stretching your lats and chest muscles. If you have tight hamstrings try bending at the knees. Muscles Highlighted: Pectorals. Start by lying face down on the floor with your palms facing down. As your partner pulls back on your hands you will feel a deep stretch in your chest muscles. Avoid this stretch if you have impingement of the shoulder.